I got a few questions about what I'm working on at my new job at Jožef Stefan Institute, so here's a short story about that. Approximately a month and a half ago I joined the team working in the laboratory for wireless sensor networks, or SensorLab as people around here call it. 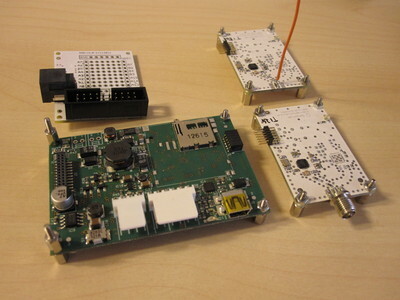 They have been developing their own software and hardware for a year or so and have come up with a impressive collection of tools for gathering data from a large network of small sensor nodes. At the core of their efforts was the VESNA platform, a wireless sensor network node with cute female name from Slavic mythology. It's a small, modular microcontroller system built around an ARM Cortex M3 chip from ST microelectronics. At the center is a core board with the CPU, non-volatile storage and power supply. Then there's a connector to the right that connects to one of a collection of radio modules that take care of different communication needs. Finally there's an Arduino-like general purpose shield connector on the top and bottom that can carry application-specific expansion modules, for instance with specialized hardware for sensors that cannot be served by the general purpose IO and instrumentation amplifiers on the core board. When you are mounting hundreds of such boards in places that were never meant to carry any electronics, getting power to each sensor gets problematic very fast. So one of the main features of VESNA is power provisioning. In addition to requiring very little power to begin with, the core board carries a very versatile power supply that is capable of efficiently harvesting power from a solar cell or a range of external voltages. You can also connect a rechargeable battery to it and it will weather through nights or other power shortages. Since you can't yet depend on having UTP cables at each and every place, communications are mostly based on radio (hence the wireless in wireless sensor networks). Radio boards are built around several multi-purpose chips that can use a number of regimes in the ISM bands, from proprietary schemes to IEEE 802.15.4, from star topology to mesh networks. On the software side there's also a lot of interesting things happening. Guys and girls at SensorLab have been developing their own C library for VESNA peripherals, which you can use to compile and run bare-bones programs on the CPU. For simpler applications there's an Arduino compatibility in the works while heavier applications might use a port of the Contiki operating system, which allows you to access sensors through web-friendly REST interfaces on a 6LoWPAN network. An the best part of it is, most of the things I described are going to be released under a free, open source license in the following year, since we are hoping to build a lively open hardware community around this project. The internet of things is the new buzzword you know and there are plenty of IPv6 addresses to go around. We think VESNA will help you make good use of at least a small part of them. Thanks for the link PulkoMandy. PowWow looks very interesting as it takes a somewhat different approach to what we are trying to do with VESNA. We're currently aiming at a somewhat higher energy budget and more processing power at the sensor node. Also, we're not (yet) at the point we would like to design our own ASICs. What are the costs involved in such a board? Did you see the raspberrypi (http://www.raspberrypi.org/)? Standarized interfaces would be great for building a community, i'm highly interested in this and had no idea you were making such cool stuff at Stefan. It's surprising how often Raspberry Pi comes up in discussions about VESNA. It's a somewhat different product though. Our vision for a sensor node is not a full-blown computer running Linux, but more like an embedded system with just enough processing power to run an IPv6 stack and a REST interface to it's sensors. Rasperry Pi is however doing an impressive job with keeping the cost down and we might learn something from them in that respect. Slavko, thanks for the offer. We are still working on the open source design and only have a few prototype boards. However, when we'll have a larger batch made, we will probably give a few to open source developers. If you have any specific use for VESNA in mind, please feel free to send me a mail. Just wondering, what is the cost of a VESNA as compared to ready made alternatives ? You can get from Olimex (for example) a myriad of M3 boards for a dozen of Euros. Many others are natively Arduino compatible (jeenode/teensy/panstamp) so very easy to program. What are the benefits of going your own way ? Chris, VESNA is quite a bit more expensive than simple development boards, because it's more than a just a Cortex M3 microcontroller. The battery and solar power supply, programmable analogue amplifier and non-volatile storage all add up. VESNA was designed to build wireless sensor networks so it comes equipped with hardware for that use case. For our use case 8-bit microcontrollers are certainly too small. With some tricks you can cram a tiny IPv6 stack into a 32 kB AVR, but not much more.